DROPS circular and double pointed needles size 2.5 and 5 mm, or size needed to get 17 sts x 23 rows in pattern on needle size 5 mm / US 8 = 4'' x 4'' (10 x 10 cm). DROPS small circular needle size 2.5 mm / US 1.5 for neckline and armhole edge. Body piece: Worked in the round on circular needle. Cast on 164-176 sts on needle size 2.5 mm / US 1.5 and work 5 cm / 2'' rib. Change to needle size 5 mm / US 8 and continue in M.1. After M.1 complete piece in M.2. Remember your knitting gauge. 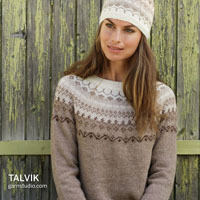 When piece measures 24-25 cm / 9 3/8"-9 ¾" bind off 4 sts each side for armhole and complete front and back pieces separately. 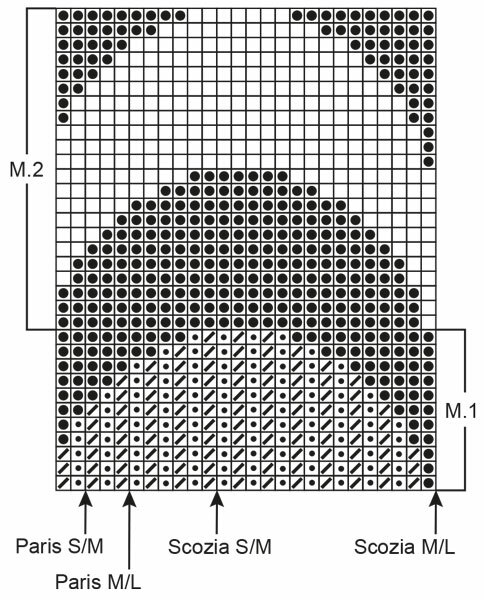 Front piece: = 78-84 sts. Bind off for armhole each side: 2 sts 1 time, 1 st 12-13 times on every * 3rd and 4th * row alternately. At the same time when piece measures 35-37 cm / 13 ¾"-14 ½" bind off the middle 6 sts for split and complete each side separately. 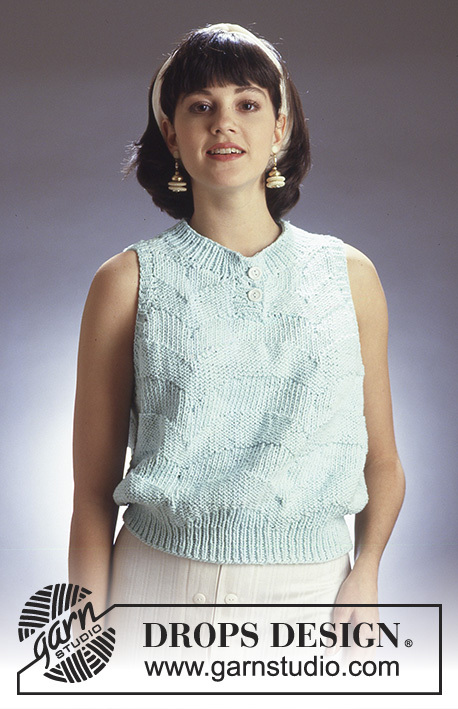 When piece measures 40-42 cm / 15 ¾"-16 ½" bind off to shape the neckline at the beg of every row from mid front: 9-11 sts 1 time, 2 sts 2 times, 1 st 2 times. Bind off remaining sts on shoulder when piece measures 48-50 cm / 18 7/8"-19 5/8". 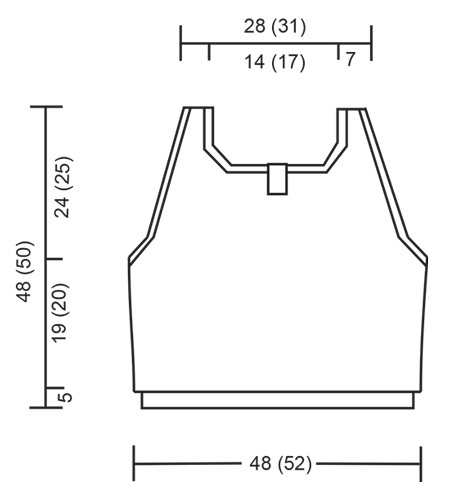 Back piece: = 78-84 sts. 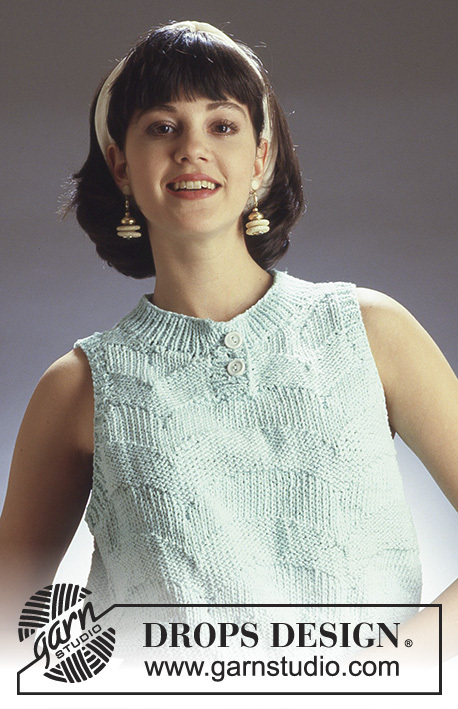 Bind off for armhole as described for front piece. 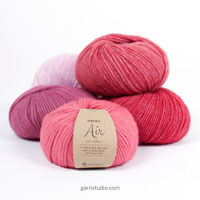 When piece measures 43-45 cm / 16 7/8"-17 5/8" bind off the middle 26-30 sts for neck and complete each side separately. Bind off to shape the neckline on every other row: 2 sts 2 times, 1 st 1 time. Bind off remaining sts on shoulder when piece measures 48-50 cm / 18 7/8"-19 5/8". 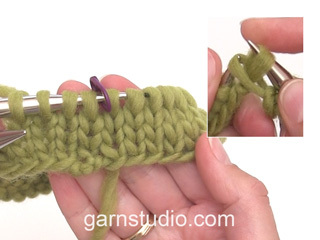 Pick up approx 70 sts round neckline on circular needle size 2.5 mm / US 1.5 and work 4 cm / 1½'' rib, bind off. 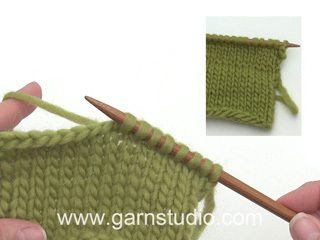 Pick up 14 sts on the left side of split on needle size 2.5 mm / US 1.5 and work 4 cm / 1½'' rib, bind off. Repeat along the right side of split, but after 2 cm / 3/4'' make 2 buttonholes evenly distributed. 1 buttonhole = bind off 2 sts and cast on 2 new sts on return row. 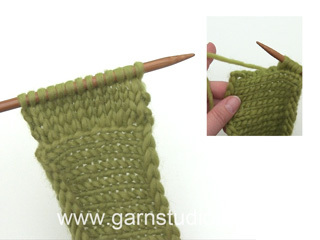 Bind off when rib measures 4 cm / 1½''. Place right rib over left rib at bottom of split and fasten. 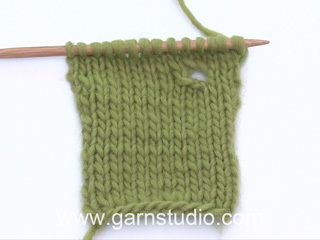 Pick up approx 75 sts round each armhole on circular needle size 2.5 mm / US 1.5 and work 1.5 cm/½" rib, bind off.